Having seen the souls caught in Limbo (the First Circle of Hell), Dante and his guide Virgil descend to the Second Circle, where those who were guilty of the sin of lust are to be found. They pass the figure of Minos, who extracts a confession from every sinner as they begin their descent, and directs them to the appropriate circle. 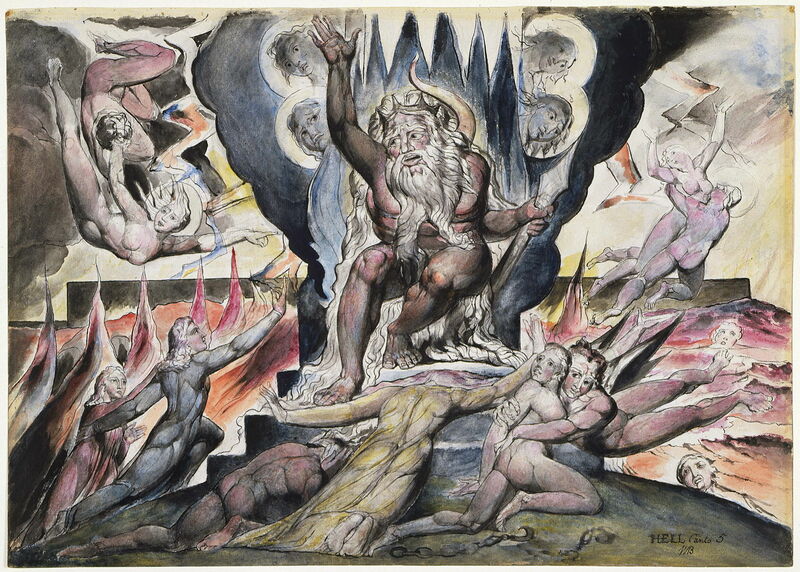 William Blake (1757–1827), Minos (Dante’s Inferno) (1824-27), watercolour on paper, dimensions not known, National Gallery of Victoria, Melbourne, Australia. Wikimedia Commons. Gustave Doré (1832–1883), Minos, Judge of Hell (c 1857), engraving, dimensions not known, location not known. Image by Moïra Elliott, via Wikimedia Commons. Then they see Cleopatra, Achilles, Paris and Tristan. It is the story of Francesca, though, which Dante tells in most detail, and possibly for the first time in literature. She appears, blown in the wind, with her lover Paolo, but it is Francesca who speaks to Dante. 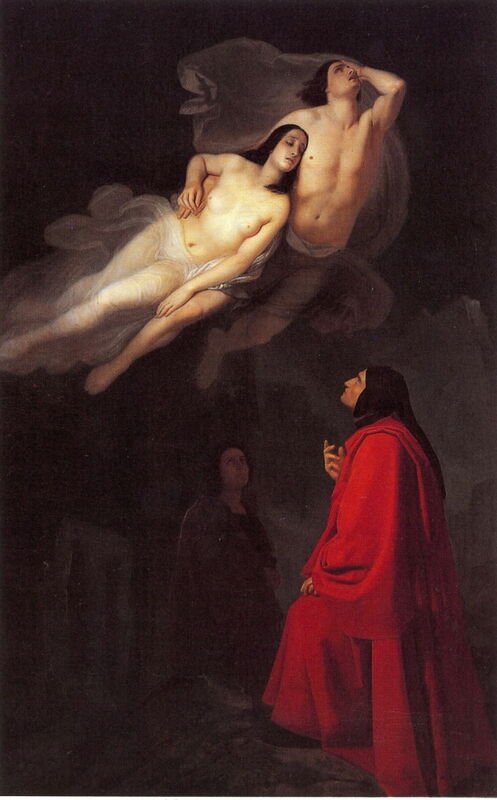 Francesca da Rimini was the aunt of Dante’s host when he lived his later years in Ravenna. In about 1275, she married Gianciotto of the ruling family in Rimini, for political reasons. There is strong suspicion that she was tricked into this: her husband turned out to be disfigured and uncouth, but pre-nuptial negotiations were conducted by his handsome and eloquent brother Paolo, suggesting that she may have been duped. 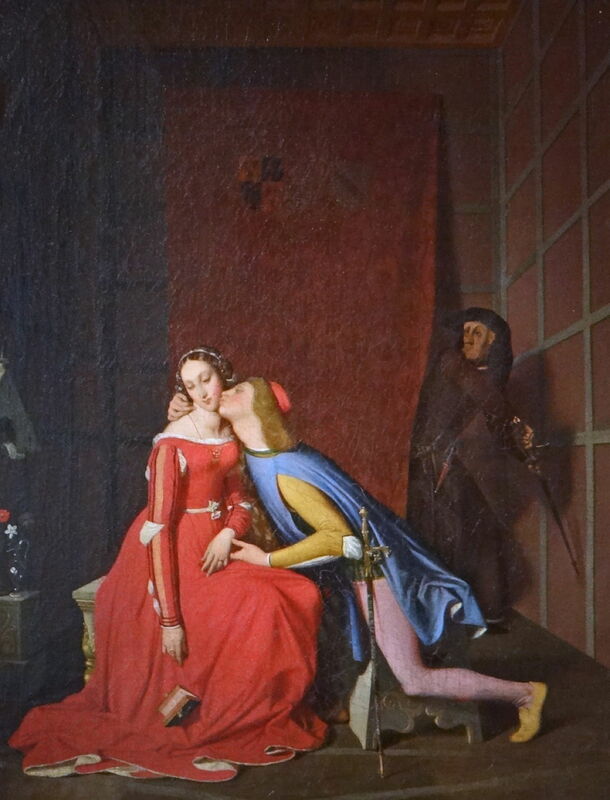 Soon after the marriage, Paolo and Francesca became lovers, apparently inspired by the story of Lancelot and Guinevere. Gianciotto suspected the couple, and one day caught them together in his wife’s bedroom. Jean Auguste Dominique Ingres (1780–1867), Paolo and Francesca (1819), oil on canvas, dimensions not known, Musée des beaux-arts, Angers, France. Wikimedia Commons. Paolo had become stuck when trying to escape through a trapdoor. Francesca was unaware of that, and let her husband in, who then attacked his brother with his sword. But Francesca stepped in between them to save her lover and was killed; Gianciotto then killed his brother, and after his own death had descended further into Hell for the double murder. Gaetano Previati (1852–1920), Paolo and Francesca (c 1887), oil on canvas, 98 x 227 cm, Accademia Carrara, Bergamo, Italy. Wikimedia Commons. 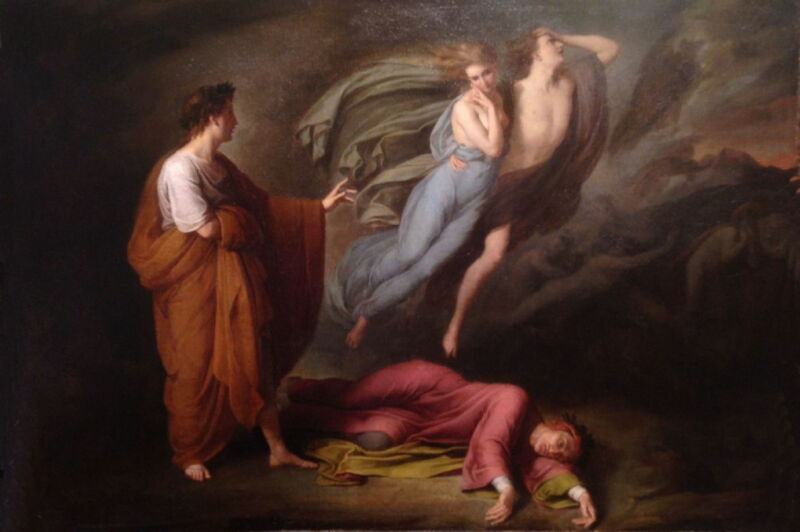 Ary Scheffer (1795–1858), Dante and Virgil with Paolo and Francesca (c 1835), oil on canvas, 72 x 101.6 cm, location not known. Wikimedia Commons. 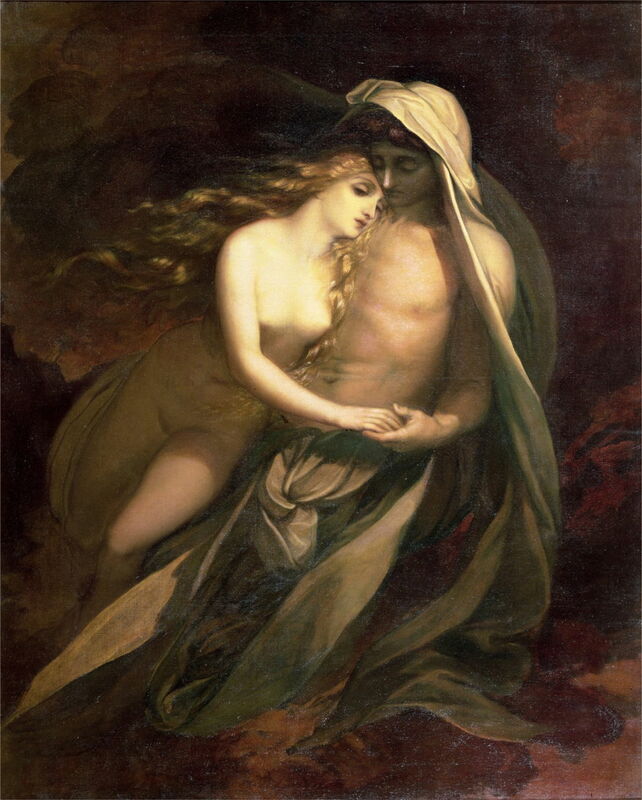 Ary Scheffer (1795–1858), Dante and Virgil Encountering the Shades of Francesca de Rimini and Paolo in the Underworld (1855), oil on canvas, 171 x 239 cm, Musée du Louvre, Paris. Wikimedia Commons. Giuseppe Frascheri (1809–1886), Dante and Virgil Encounter Paolo and Francesca (1846), oil on canvas, 61 x 38.5 cm, Civica Galleria d’Arte Moderna Savona, Savona, Italy. Wikimedia Commons. George Frederic Watts (1817–1904), Paolo and Francesca (The Story of Rimini) (date not known), media and dimensions not known, Private collection. Wikimedia Commons. 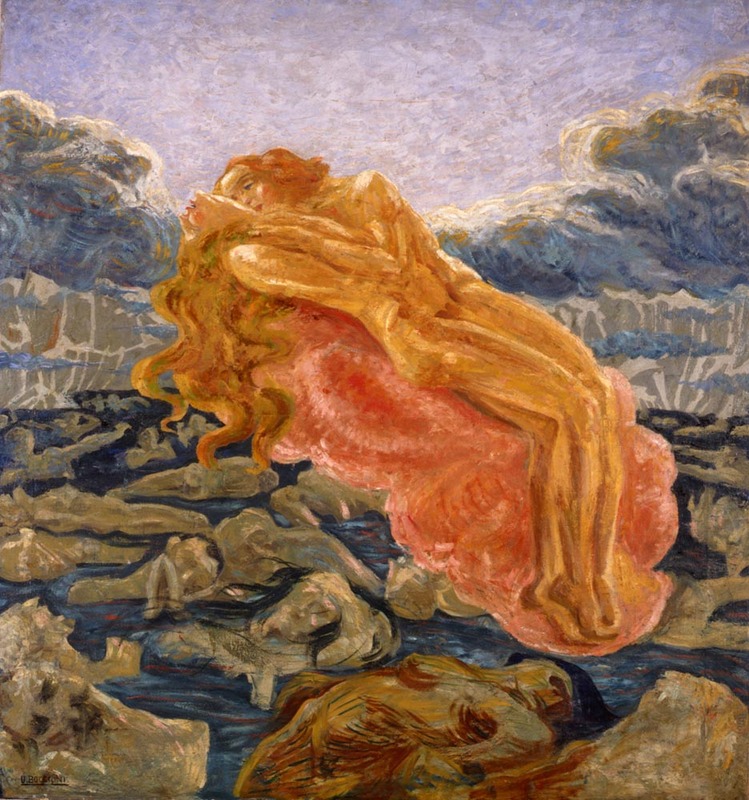 Umberto Boccioni (1882–1916), The Dream (Paolo and Francesca) (1908-09), oil on canvas, 140 × 130 cm, Private collection. Wikimedia Commons. 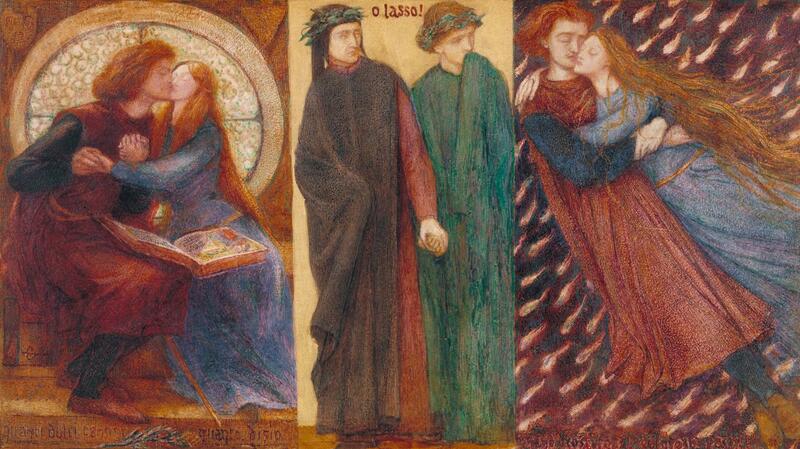 The story is told in Dante Gabriel Rossetti’s watercolour triptych: at the left, the lovers are reading the legend of Lancelot and Guinevere. 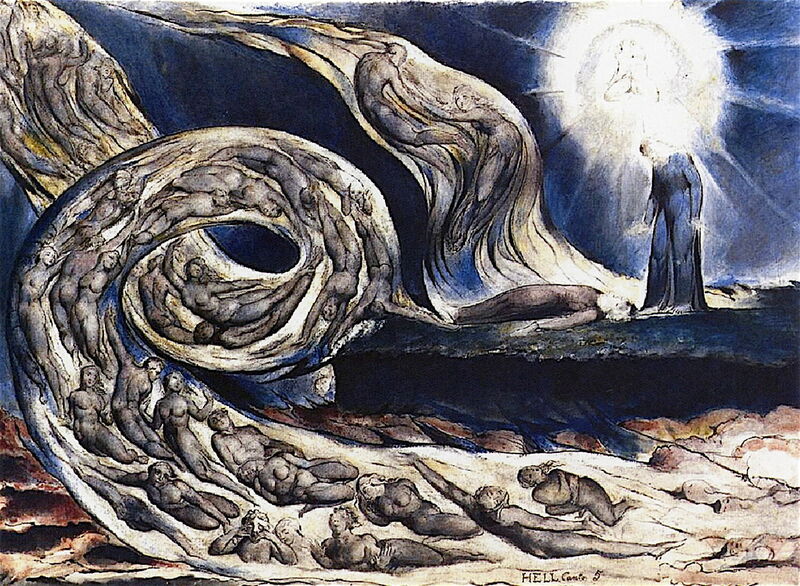 In the centre are Dante and Virgil, and at the right Paolo and Francesca being blown in the storms of the Second Circle of Hell. 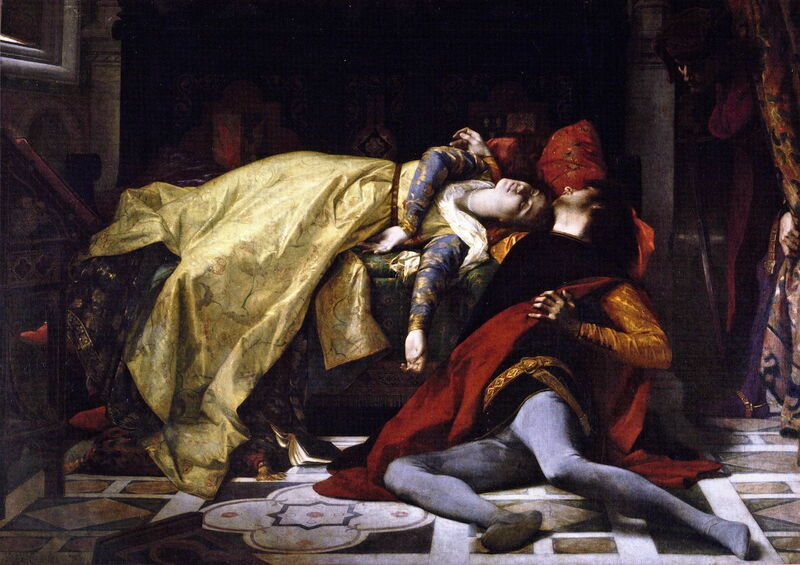 Dante faints at the tragic story that Francesca has told him, and collapses as if dead. Umberto Boccioni (1882–1916) was an Italian painter and sculptor whose tragically short career was a major influence over the development of Futurism. Drafted into the Italian Army during the First World War, he was thrown from his horse and trampled to death when he was only thirty-three. Alexandre Cabanel (1823–1889) was a major French painter of history in an academic style, and a precocious artist. He won the Prix de Rome in 1845, and was appointed a professor at the École des Beaux-Arts in Paris in 1864, teaching many successful pupils including Jules Bastien-Lepage. This article summarises his career and work. Gustave Doré (1832–1883) was the leading French illustrator of the nineteenth century, whose paintings are still relatively unknown. 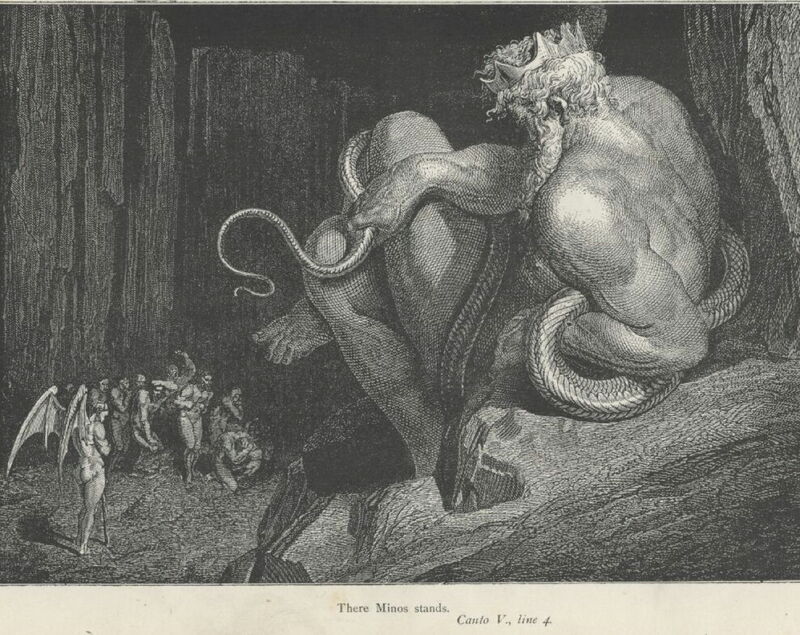 Early in his career, he produced a complete set of seventy illustrations for translations of the Inferno, which were first published in 1857 and continue to be used. 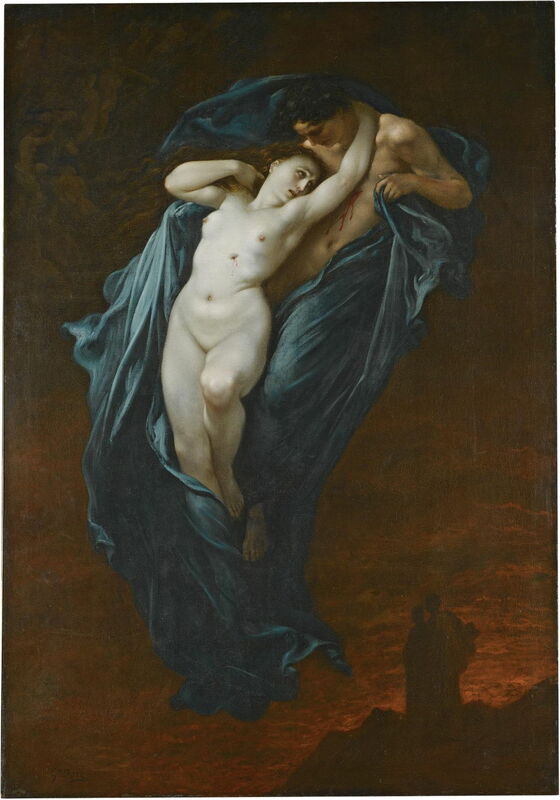 These were followed in 1867 by more illustrations for Purgatorio and Paradiso, and this painting was highly praised when shown at the Paris Salon in 1863. This article looks at his paintings. Giuseppe Frascheri (1809–1886) was an Italian painter in fresco and oils who has been almost completely forgotten. Jean Auguste Dominique Ingres (1780–1867) was a major French painter in Neoclassical style, best known for his history and other narrative paintings. He was a pupil of Jacques-Louis David, and continued much in his tradition, and in opposition to the more Romantic painting of Eugène Delacroix. His work extended from portraits to Orientalism. Gaetano Previati (1852–1920) was an Italian painter who worked mainly in Divisionist style, but is now known for his Symbolism. He was most famous in the period 1880-1920, during which he was involved in the Venice Biennale and exhibitions in Italy and Paris. Dante Gabriel Rossetti (1828–1882) was of Italian descent but born in London. In 1848, he co-founded the Pre-Raphaelite Brotherhood, and was a major figure in British painting until his early death in 1882. A published poet and author himself, many of his paintings were in response to literature, particularly the poems of John Keats. He had a succession of relationships with his models and muses, including Elizabeth Siddal, Fanny Cornforth, and William Morris’s wife Jane. The triptych shown here is the earliest of at least three paintings of his which show Paolo and Francesca, another similar triptych being from 1862. 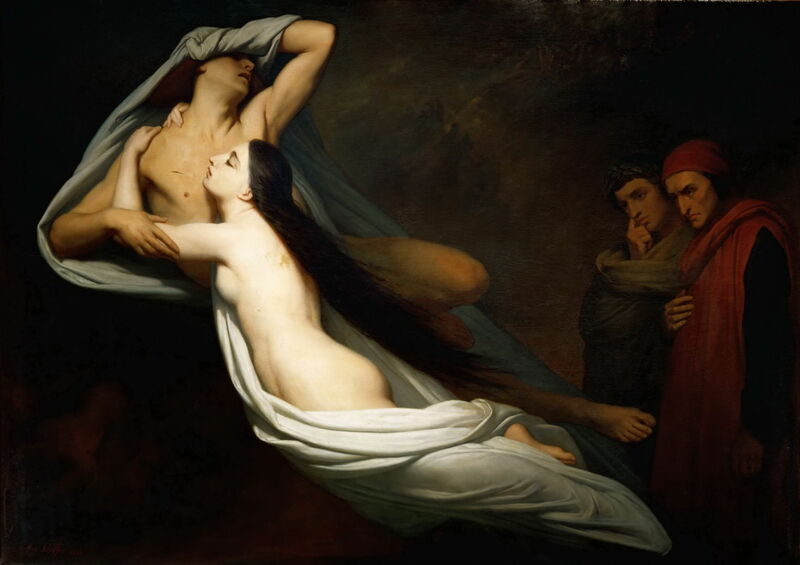 Ary Scheffer (1795–1858) was a major narrative painter of the first half of the nineteenth century, born in the Netherlands but trained and working in Paris. Among his favourite literary themes were Goethe’s Faust, and the story of Paolo and Francesca. This article looks at his narrative work. George Frederic Watts (1817–1904) was a major British painter and sculptor in the middle and late nineteenth century who was associated with several artistic circles and movements including the Pre-Raphaelites, but who worked independently in more Symbolist style. This article looks at his career and paintings. Posted in General, Life, Painting and tagged Blake, Boccioni, Cabanel, Dante, Divine Comedy, Doré, Frascheri, Ingres, narrative, painting, Previati, Rossetti, Scheffer, Watts. Bookmark the permalink.